Burlington High School was honored today by the presence of BHS alum (Class of 1974) and Nobel Prize winner (2003) Roderick MacKinnon. Dr. MacKinnon returned to BHS for the official unveiling of a painting in our main lobby intended to showcase his accomplishments and share with all who enter our doors how proud we are to claim him as one of our own. This project was the result of the generosity of the Burlington Education Foundation which funded a grant proposal from Science Department Head Peter Nassiff and BHS art teacher Christina Chang. The project allowed our art students to work with a professional artist in-residence (Lei-Sanne Doo) for 10 days to complete this amazing work of art. 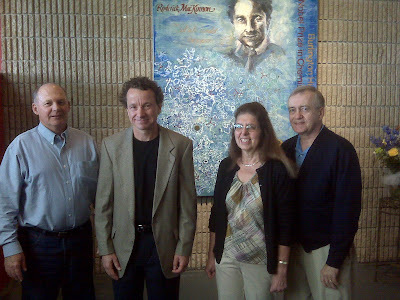 During his vist today, Dr. MacKinnon was kind of enough to speak to our current students. He reminded the audience to remember two things: 1. Always keep an open mind 2. Find something you are good at and focus your energy there. He told our students that when he sat in their places he could not have imagined that his path would have led to a Nobel Prize. With this in mind, he encouraged them to concentrate on blazing their own path and that no final destination should be unimaginable. "Never tell yourself you're not good at something. Keep a very open mind because you probably have abilities that go way beyond your imagination." "I keep telling myself, there are things I don't know. I could know more. I need to be more like a student." "If I could take a path like this, probably anyone could. You all have great potential inside you." "Being good at something is fun, but it isn't easy. It comes back to hard work." Everyone at BHS would like to thank Dr. MacKinnon for taking the time to come back to BHS and share his wisdom. 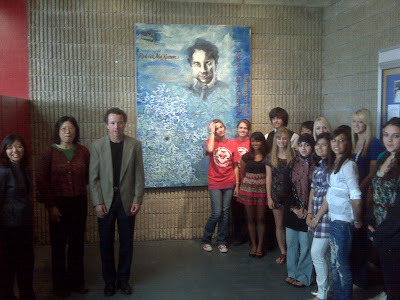 Dr. MacKinnon with BHS Art Teacher Christina Chang, Artist Lei-Sanne Doo, and some of our student artists. 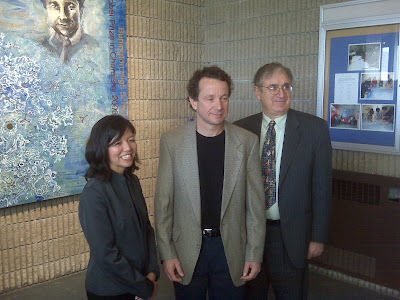 Dr. MacKinnon with BHS Art Teacher Christina Chang and BHS Science Dept. Head Peter Nassiff.